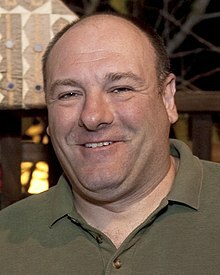 James Joseph Gandolfini Jr. (Italian: [ɡandolˈfiːni]; September 18, 1961 – June 19, 2013) was an American actor best known for his role as Tony Soprano, the Italian-American crime boss in HBO's television series The Sopranos. He won three Emmy Awards, three Screen Actors Guild Awards, and one Golden Globe Award. Gandolfini’s performance as Tony Soprano is widely regarded as one of the greatest performances in television history. His notable film roles include mob henchman Virgil in True Romance (1993), Lt. Bobby Dougherty in Crimson Tide (1995), and Mayor of New York in The Taking of Pelham 123 (2009). Other roles are enforcer and stuntman Bear in Get Shorty (1995) and impulsive "Wild Thing" Carol in Where the Wild Things Are (2009). For his performance as Albert in Enough Said (2013), Gandolfini posthumously received much critical praise and several accolades, including a Screen Actors Guild Award nomination and the Boston Society of Film Critics Award for Best Supporting Actor. In 2007, Gandolfini produced Alive Day Memories: Home from Iraq, a documentary in which he interviewed injured Iraq War veterans and in 2010, Wartorn: 1861–2010 examining the impact of posttraumatic stress disorder on soldiers and families throughout several wars in U.S. history from 1861 to 2010. Gandolfini was born in Westwood, New Jersey. His mother, Santa (née Penna), was a high school food service worker of Italian descent who was born in the United States and raised in Naples. His Italian-born father, James Joseph Gandolfini Sr., was a native of Borgo Val di Taro who worked as a bricklayer and cement mason and later the head custodian at Paramus Catholic High School. James Sr. earned a Purple Heart in World War II. Gandolfini's parents were devout Roman Catholics who spoke Italian at home. Due to the influence of his parents, he developed a strong sense of Italian-American identity and visited Italy regularly. He had two sisters. Gandolfini grew up in Park Ridge, New Jersey, and graduated from Park Ridge High School in 1979, where he played basketball, acted in school plays, and was awarded the title "Class Flirt" in his senior yearbook. He earned a BA in Communications from Rutgers University in 1983, where he worked as a bouncer at an on-campus pub. He also worked as a bartender and club manager in Manhattan prior to his acting career. He was introduced to acting as a young man living in New York City, when he accompanied his friend Roger Bart to a Meisner technique acting class, where he studied for two years under Kathryn Gately at The Gately Poole Conservatory. Gandolfini performed in a 1992 Broadway production of A Streetcar Named Desire as Steve Hubbell for 168 performances, and in a 1995 Broadway production of On the Waterfront as Charley Malloy for 24. One of his earlier film roles was that of Virgil, a brutal mob enforcer, in the romantic thriller True Romance (1993), for which he said one of his major inspirations was an old friend of his who was a hitman. In the film Terminal Velocity (1994), Gandolfini played Ben Pinkwater, a seemingly mild-mannered insurance man who turns out to be a violent Russian mobster. In 1995 he was in the box office hit Crimson Tide. In that same year in Get Shorty (1995), he appeared as a bearded ex-stuntman with a Southern accent, and in The Juror (1996), he played a mob enforcer with a conscience. 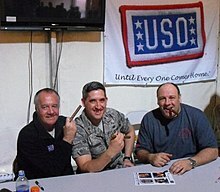 In 2007, Gandolfini produced a documentary with HBO focused on injured Iraq War veterans and their devotion to America while surveying the physical and emotional costs of war. Gandolfini interviewed ten surviving soldiers, who revealed their thoughts about the challenges they face reintegrating into society and family life. They also reflected on their memories of the day when they narrowly escaped death and what life may have been like in other circumstances. That same year, Gandolfini returned to HBO as the executive producer of the Emmy-nominated documentary special, Alive Day Memories: Home From Iraq, his first project after The Sopranos and the first production for his company Attaboy Films, which was opened in 2006 with producing partner Alexandra Ryan. He returned to the stage in 2009, appearing in Broadway's God of Carnage with Marcia Gay Harden, Hope Davis, and Jeff Daniels. He received a Tony Award nomination in the category of Best Performance by a Leading Actor in a Play for his role in the play, but lost to Geoffrey Rush, who played the lead in Exit the King. He played the Mayor of New York in the 2009 remake of The Taking of Pelham 123. In 2010 Gandolfini produced another documentary with HBO, which analyzed the effects of posttraumatic stress disorder throughout American history, from 1861 to 2010. It featured interviews with American military officials on their views of PTSD and how they are trying to help soldiers affected by it. Letters from soldiers of the American Civil War and World War I who were affected by PTSD are examined, along with interviews with soldiers affected by PTSD and their families. Gandolfini was executive producer of the HBO film about Ernest Hemingway and his relationship with Martha Gellhorn, titled Hemingway & Gellhorn (2012). Gandolfini reunited with The Sopranos creator David Chase for Not Fade Away (2012), a music-driven production set in 1960s New Jersey, and the latter's feature film debut. Two films which he completed before his death on June 19, 2013, were released posthumously. The first was Enough Said, a romantic comedy which he co-starred with Julia Louis-Dreyfus. The film was met with positive reviews, particularly for Gandolfini's performance. He received posthumous Best Supporting Actor awards from the Boston Society of Film Critics and the Chicago Film Critics Association as well as multiple nominations, including a nomination for the Screen Actors Guild Award for Outstanding Performance by a Male Actor in a Supporting Role. His final film performance was in The Drop, a crime drama in which he co-starred with Tom Hardy and Noomi Rapace. Released September 12, 2014, the film was met with positive reviews for Gandolfini's performance. Gandolfini is credited as an executive producer on the HBO miniseries The Night Of which premiered in 2016. Gandolfini was set to star in the miniseries when it was pitched to HBO in 2013, but they ultimately decided not to go ahead with the show. HBO reversed their decision a few months later, and the show was green-lit, with Gandolfini still set to star, however he died before filming began. Actor John Turturro assumed the role intended for Gandolfini. Gandolfini maintained ties with his Park Ridge, New Jersey hometown by supporting its Octoberwoman Foundation for Breast Cancer Research. He lived in New York City and owned a lot on the Lake Manitoba Narrows. Gandolfini had lived on a 34-acre (14 ha) property in Chester Township, New Jersey. In 2009 he purchased a home in the hills of Tewksbury Township, New Jersey. GQ's Brett Martin said about Gandolfini: "In interviews, which the actor did his very best to avoid, the actor would often fall back on some version of 'I'm just a dumb, fat guy from Jersey.'" Gandolfini and his first wife, Marcy Wudarski, were married in March 1999, and Gandolfini filed for divorce in March 2002. It was finalized December 18, 2002. He left behind a son named Michael (born in 1999). On August 30, 2008, after two years of dating, Gandolfini married former model and actress Deborah Lin in her hometown of Honolulu, Hawaii. From this marriage, he left behind a daughter named Liliana Ruth Gandolfini (born October 2012). Gandolfini died suddenly at the age of 51 in Rome on June 19, 2013. He was expected to travel to Sicily a few days later to receive an award at the Taormina Film Fest. After he and his family had spent the day sightseeing in sweltering heat, his 13-year-old son Michael discovered him unconscious at around 10 p.m. local time on the bathroom floor at the Boscolo Exedra Hotel. Michael called reception, who in turn called emergency paramedics. Gandolfini arrived at the hospital at 10:40 p.m. and was pronounced dead 20 minutes later. An autopsy confirmed that he had died of a heart attack. While word of his death spread, politicians such as John McCain and Chris Christie took to the Internet to respond. Christie ordered all New Jersey State buildings to fly flags at half staff on June 24 to honor Gandolfini when his body was returned to the United States. The day after Gandolfini's death, Bruce Springsteen and the E Street Band, which has long featured Sopranos co-star Steven Van Zandt on guitar, dedicated a performance of their classic album Born to Run by doing a rendition for Gandolfini. Gandolfini's body was returned to the United States on June 23. Family spokesman Michael Kobold thanked both Italian and American authorities for expediting the repatriation process, which normally takes seven days. Broadway dimmed theater marquee lights on the night of June 26 in Gandolfini's honor. Gandolfini's funeral service was held on June 27, 2013, at the Episcopal Cathedral of Saint John the Divine in the Morningside Heights neighborhood of Manhattan, New York. He was cremated and his ashes were given to his family. TV Guide published a special tribute to Gandolfini in their July 1, 2013, issue following his death, devoting the entire back cover of that issue to his image. In it, columnist Matt Roush cited Gandolfini's work as Tony Soprano as an influence on subsequent cable TV protagonists, saying: "Without Tony, there's no Vic Mackey of The Shield, no Al Swearengen of Deadwood, no Don Draper of Mad Men (whose creator, Matthew Weiner, honed his craft as a writer on The Sopranos)." Similar testimonials were given by his co-stars and colleagues, including Edie Falco, who expressed shock and devastation at his death; Sopranos creator David Chase, who praised him as a "genius"; Bryan Cranston, who stated that his Breaking Bad character Walter White would not have existed without Tony Soprano; and Gandolfini's three-time co-star Brad Pitt, who expressed admiration for Gandolfini as a "ferocious actor, a gentle soul and a genuinely funny man". Three months after his death, it was reported that in Gandolfini's last will and testament, dated December 2012 and filed July 2013 in Manhattan Surrogate's Court, he left a substantial portion of his estimated $70 million estate to his two sisters, widow, and daughter. The will did not state any inheritance for his only son, Michael, because Gandolfini provided for him a separate trust funded by a life insurance policy. In December 2013, following an online petition campaign started by Gandolfini's high school classmate, Lori Fredrics, his hometown renamed its Park Avenue to James Gandolfini Way at a public ceremony attended by several of his former Sopranos co-stars. Spike Jonze's 2013 film Her is dedicated to Gandolfini. Jonze and Gandolfini had previously worked together on Where the Wild Things Are. In 2014, Gandolfini was posthumously inducted into the New Jersey Hall of Fame. In 2019, his son Michael was cast as the younger version of James's character Tony Soprano in The Sopranos prequel film The Many Saints of Newark. Stories of Lost Souls Vincent Segment: "A Whole New Day"
2007 Stories USA The Man Segment: "Club Soda"
1997 Gun Walter Difideli Episode: "Columbus Day"
2004 Saturday Night Live Unidentified New Jersey Resident Episode: "Ben Affleck/Nelly"
^ "James Gandolfini Is Dead at 51; a Complex Mob Boss in 'The Sopranos'". The New York Times. Retrieved December 5, 2015. ^ "James Gandolfini as Tony Soprano". HBO. Archived from the original on January 9, 2010. ^ a b c "Youtube interview of James Gandolfini – Inside the Actors Studio, 2004". YouTube. May 15, 2007. Retrieved April 11, 2010. ^ "Santa Gandolfini Obituary - Search Santa Gandolfini Recent Obituaries". Genealogybank.com. Retrieved November 5, 2014. ^ a b "This Is James Gandolfini, He's Not Tony, The Actor Behind The Sopranos Mob Boss Is More Like "A 260-Pound Woody Allen"". CBS News. April 8, 2007. Retrieved April 11, 2010. ^ DAVE ITZKOFF (June 19, 2013). "James Gandolfini Is Dead at 51; a Complex Mob Boss in 'The Sopranos'". The New York Times. Retrieved November 5, 2014. ^ Heilpern, John (April 2009). "Out to Lunch: Curtains for Gandolfini". Vanity Fair. ^ "James Gandolfini – Britannica Online Encyclopedia". Encyclopædia Britannica. Retrieved April 11, 2010. ^ "James Gandolfini dies at 51; actor starred in 'The Sopranos'". Los Angeles Times. Retrieved August 25, 2015. ^ "Gandolfini 'displayed his usual sense of humor' when he signed will". Daily News. New York. September 19, 2013. Retrieved August 25, 2015. ^ Goldman, Jeff (June 20, 2013). "Yearbook photos of James Gandolfini acting, playing basketball at Park Ridge High School". The Star-Ledger. Retrieved June 20, 2013. ^ a b "James Gandolfini". AskMen.com. June 2013. Archived from the original on February 19, 2008. Retrieved June 20, 2013. ^ "25 (Not Quite) Random Facts About James Gandolfini". Broadway.com: Broadway Buzz. April 9, 2009. Retrieved February 13, 2017. ^ "R.I.P. James Gandolfini - June 19th 2013". Archived from the original on August 12, 2014. Retrieved July 6, 2013. ^ Brown, Eric (June 19, 2013). "James Gandolfini: The Late Actor's Best Scenes In 'The Sopranos,' 'True Romance' And More". International Business Times. Retrieved May 7, 2015. ^ "The 50 Greatest TV Icons - JAMES GANDOLFINI". Entertainment Weekly. December 27, 2007. Retrieved June 20, 2013. ^ "Clive James on The Sopranos". The Daily Telegraph. June 30, 2013. Retrieved December 5, 2013. ^ "James Gandolfini: What Was the 'Sopranos' Star's Net Worth at the Time of His Death?". Retrieved January 11, 2018. ^ "HBO Orders Hemingway Film With Nicole Kidman and Clive Owen". TV Guide. ^ McNary, Dave (January 24, 2011). "Gandolfini, Chase reconnect at 'Twylight'". Variety. Retrieved February 1, 2011. ^ Andreeva, Nellie (January 24, 2011). "'Sopranos' Big-Screen Reunion: James Gandolfini Joins David Chase's New Movie". Deadline Hollywood. Retrieved February 1, 2011. ^ "Enough Said". Rottentomatoes.com. September 18, 2013. Retrieved November 5, 2014. ^ "The Drop". Rottentomatoes.com. September 12, 2014. Retrieved November 5, 2014. ^ "Everybody's scared to upset Mr. Soprano". Winnipeg Free Press. October 17, 2007. Retrieved April 11, 2010. ^ Slaught, Veronica. "Sopranos star James Gandolfini buys home in Tewksbury", The Star-Ledger, September 24, 2009. Accessed May 12, 2017. "The star of The Sopranos previously lived in a 150-year-old colonial on 34 acres in Chester Township." ^ Slaght, Veronica (September 24, 2009). "'Sopranos' star James Gandolfini buys home in Tewksbury". The Star-Ledger. Retrieved June 20, 2013. ^ Martin, Brett (July 2013). "The Night Tony Soprano Disappeared". GQ Magazine. ^ a b Ryan, Joal (October 18, 2002). "Gandolfini Comes Clean". E! News. Retrieved January 23, 2019. ^ Keller, Julie (December 18, 2002). "Gandolfini Divorce Finalized". E! News. Retrieved January 23, 2019. ^ "James Gandolfini discovered by 13-year-old son". The Daily Telegraph. Retrieved June 20, 2013. ^ Nichols, Katherine (August 31, 2008). "Sopranos Star James Gandolfini Gets Married". People. Archived from the original on September 12, 2015. Retrieved June 20, 2013. ^ "James Gandolfini Welcomes Daughter". USA Today. October 12, 2012. Retrieved June 19, 2013. ^ "James Gandolfini died of cardiac arrest". News24. Associated Press. June 20, 2013. ^ "James Gandolfini Cause of Death: Autopsy Confirms Heart Attack Killed 'Sopranos' Star, Source Says". The Huffington Post. Retrieved June 11, 2015. ^ "Reactions to the Death of James Gandolfini". The New York Times. Retrieved June 21, 2013. ^ "Stars share reaction to James Gandolfini's death". Yahoo! News. Retrieved June 21, 2013. ^ "James Gandolfini's death stirs reactions from stars". Reno Gazette-Journal. Reno, Nevada. Archived from the original on June 24, 2013. Retrieved June 21, 2013 – via USA Today. ^ "Governor Christie orders flags at half-staff on Mon., June 24 to recognize James Gandolfini". NorthJersey.com. Archived from the original on June 26, 2013. Retrieved June 21, 2013. ^ "Bruce Springsteen Dedicates 'Born to Run' to James Gandolfini Onstage". Rolling Stone. June 21, 2013. Retrieved June 21, 2013. ^ "James Gandolfini's Body Returned to U.S." People. June 23, 2013. Archived from the original on March 8, 2016. ^ "Broadway to dim marquee lights for Gandolfini". United Press International. Retrieved June 25, 2013. ^ "Edie Falco: Onscreen Love With James Gandolfini 'One of the Greatest I've Ever Known'". The Hollywood Reporter. Retrieved October 12, 2018. ^ Chilton, Martin (June 20, 2013). "James Gandolfini was a genius, says Sopranos creator". ISSN 0307-1235. Retrieved October 12, 2018. ^ "Celebrities React to the Death of James Gandolfini". TV Guide. June 19, 2013. ^ Roush, Matt (July 1, 2013). "A Soprano's Swan Song". TV Guide. pp. 18–21. ^ Ross, Barbara. "James Gandolfini 'displayed his usual sense of humor' when he signed will prior to his death". The Daily News. ^ Alexander, Dan (December 2, 2013). "Park Ridge Pays Tribute to James Gandolfini". New Jersey 101.5. ^ Nemetz, Dave (January 22, 2019). "Sopranos Prequel: James Gandolfini's Son Michael to Play Young Tony". TVLine. Wikimedia Commons has media related to James Gandolfini. "James Gandolfini". Find a Grave. Retrieved March 28, 2017.